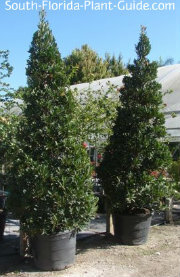 A small tree with majestic presence, Japanese blueberry combines tropical foliage with an appealing Christmas tree look. This beautiful accent is under-used because not many people have discovered it. But its good looks, low maintenance requirements, and small size make it ideal for plant nuts and armchair gardeners alike. The narrow form fits in almost anywhere, even in areas of limited space. 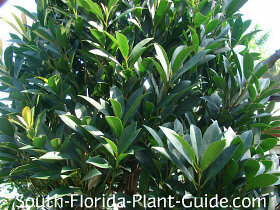 As landscape trees, these make great substitutes for holly trees, most of which prefer cooler areas of Florida. The tree produces small white flowers in spring followed by dark blue inedible berries in fall and winter. The dense foliage is a lush deep green with an occasional bright red leaf. 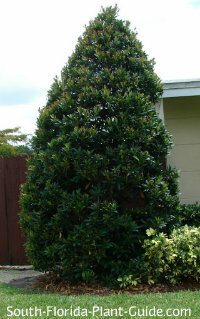 Most people leave the tree's foliage full to the ground - though you can trim up the base for a more classic tree look. 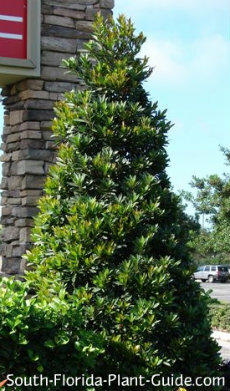 It can be manicured to use in formal designs or branch-trimmed occasionally for use in more casual, eclectic landscapes. Japanese blueberries are versatile trees - they can be used very effectively for privacy, specimen trees, backdrop plantings, or even in "natural" groupings. Unless you're very young or extremely patient, buy a decent size tree (25 gallon) since the rate of growth is slow. This is an evergreen tree that prefers full to partial sun. It's a slow grower to 15 to 20 feet, though it can be kept shorter. Japanese blueberries are cold hardy and thrive anywhere in South Florida. Add organic peat humus or top soil, mixed with composted cow manure, to the hole when you plant. 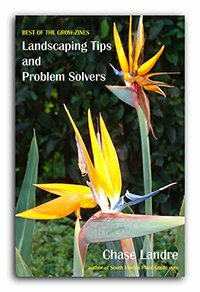 Depending on the look you want, you can cut back branches now and then to retain a nice form, or shear into a perfect cone-shape. Do the shearing no more than 2 or 3 times a year for the health of the tree and because a slow growth rate means it will take a while to flush back out. These trees can be topped as well. 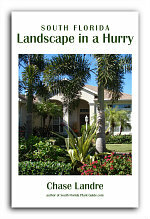 Any hard pruning should be done during warm weather - after mid-March and before mid-October. Because of the tree's compact form, you can plant as close as 4 feet from the house. If planting in a row, space 4 to 5 feet apart to fill in more quickly, or 8 feet apart to leave more room between each one. Or you might group them as if nature did it, using 3 or more in a slightly random pattern about 5 or 6 feet (or more) apart. Situate at least 3 feet away from shrubs. Along a walk or drive, come in 6 feet or more. 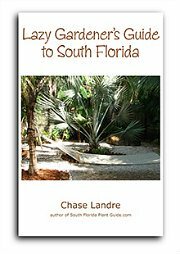 COMPANION PLANT SUGGESTIONS: Gold mound, Nora Grant ixora, dwarf allamanda, ruella, croton, and society garlic.